How Can I Encourage a Friend to Homeschool? Does she have the heart of a homeschooler? It is good for her to consider the “cost”. Homeschooling is a commitment of time, talent, and money. Parents have to die to self in more ways when they homeschool. How interested is she is the spiritual welfare of her children? Pray with her and for her about making the decision to homeschool. Ask your spouse to talk to her spouse, or meet as couples to discuss homeschooling. Does she have support from family, friends, and church? She has a least one homeschooling friend since you are reading this article. Please consider making yourself available to help her during the first year, if she decides to homeschool or for the next year if she needs help. Perhaps you can do one or two subjects together in a small family co-op. History and science are great subjects to share in a multi-level setting. You can meet two to four times a month to do activities together or take field trips together. With friends at church who homeschool, she will have a built-in support group. There is more likely to be acceptance at her church plus her children will have friends who homeschool. It helps if the extended family supports the homeschooling effort. However, if that’s not the case, she can still homeschool. If God has called her to homeschool, it doesn’t matter in the big picture if family and friends agree. Encourage her to persevere. I’ve seen family and friends come around in the long run. They may not come back and tell you, but they will stop bothering you! Happily, sometimes they come tell you they were wrong and commend your efforts. First, you can tell her why you are homeschooling. Sometimes a personal testimony from a trusted friend makes the difference. Tell her what you do, how you handle friends and family, what a difference homeschooling has made (so far!) in your child(ren), what your support group does, etc. You can do this! Then, you can direct her to the Considering Homeschooling website. They are pretty straightforward about the whys. Lots of statistics and research. There are results! One family that came to our last Considering Homeschooling meeting is going to homeschool because they have seen the older children of another homeschooling family and want their children to grow up like them. Nowhere in the Bible does God tell the kings (government) to train or teach the children. The kings did train their children–and prisoners like Daniel! That’s something to ponder! God has a wonderful plan. The family is the backbone of a nation. God doesn’t want cookie-cutter thinking. He wants families to be unique and different because individuals are unique and different. He knew that if all the children were taught from one source (homogenized education) it could be a problem–like education under communism. Help her to look up scriptures with words such as father(s), mother(s). child, children, train, and teach. You’ll find verses that support the concept of parents training the children. The Bible says not to be a companion of fools. If children are foolish and we aren’t supposed to be companions of fools, what is the point of sending a child to be with a bunch of fools? Perhaps the teacher is a “fool” also. Some teachers are wonderful Christians who are dedicating their lives to their home mission field–the public school. But many are atheists, humanists. Do you expect them to train your children up in the nurture and admonition of the Lord??? It’s like the Captain of a ship. If it crashes while the first mate is steering, the Captain is still responsible. Parents are the “responsible citizens of the universe when it comes to training/educating their children. There are encouraging articles about homeschooling, curriculum reviews, and information about homeschool curriculum on our website. 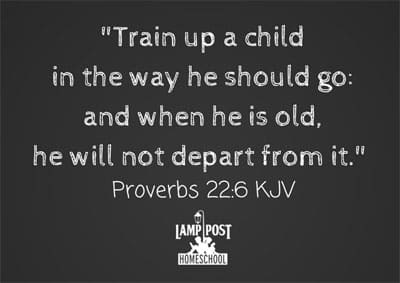 We homeschool all of our children through high school, all nine have graduated from our homeschool high school. Five are college graduates and two are in college. One son decided to work in the real world after completing homeschool high school. He is pursuing a different path at this point. If he wants to attend college down the road, he is capable. That’s up to him. Our job as parents was to send him out into the world prepared to follow God’s will for his life. Their employers are impressed with their character, behavior, and work skills. Their college professors are impressed and tell us about the differences they see in our children! Are they perfect children? No, they make mistakes like everyone, but God is perfecting them. The further we go on the homeschool path, the more convinced we are that it is the BEST for our children! If you are able, we encourage you to teach your children at home.